"You do. Because of who you are. What you are. One half brimming with dark curiosities and a fierce appetite for all things amd. But the other half whimsy and light - filled with courage and loaylty." He bites his lower lips, a gesture so minute I might've imagined it. "Nothing can break the chains you have on my heart. For you are Wonderland." I hiss in frustration. I want to be furious that he made a liar out of me about my feelings, and even angrier that he goaded my wings to appear, since I'm stuck trying to hide them until they fade back into my skin. But I have to admit, embracing the reality of my power is heady. I'm finding it difficult to hold a grudge when he was only trying to show me how strong I really am. When it's in fact what he always does. The first pixie was right. I'm the epitome of Alice. An Alice gone mad, who thirsts for blood. When I find Queen Red, she'll beg me to stop at her heart. "Them's the rules," a duckbilled bird scoffs, shaking his parasol in Morpheus's face. "Made by the queen herself." "Them's the rules?" Morpheus chuckles, deep and soft. "You need to work on your scare tactics, Ducky. Incorrect grammar wielded by a good bird who carries a frilly sunshade. Doesn't have quite the effect you're going for." My mind blurs to a ripple of pleasure when his soft, full lips at last make contact with mine. He starts to deepen the kiss, but pauses, intent on the glass behind him. "You gotta be kidding me." I glance over my shoulder. Outside, Morpheus hangs on the glass in moth form, level with my head, glaring at us with his bulbous gaze. Even without a face, his smugness is apparent. His favorite pastime is interrupting Jeb's romantic moments. I try not to laugh, but can't help myself. "Cocky son of a bug." I made this mistake of reading Ensnared immediately after I finished Unhinged. There was no pause, no break. I put down Unhinged and picked up Ensnared, which was sitting right next to me, without hesitation. Well, I guess this isn't technically a "mistake" unless you're in the review business. Then it makes for rather tricky review writing because everything kind of blends together. However, that is how good these two books (and this series) are. I was so engrossed and wrapped up in the story of Alyssa, Morpheus, Jeb, and Wonderland that I could not wait to find out how in ended! This is one of the nice thing about binging on series - the nonstop reading! Not having to wait a year, or more, to find out what happens next. I'm not going to go too in depth with the plot details since this is a review for both books in a series, but my inability to wait between these two books speaks volumes. A.G.'s writing is amazingly detailed. I picture myself in our world, Wonderland, and AnyElsewhere. She entrances her readers with her words, imagery, and characters. 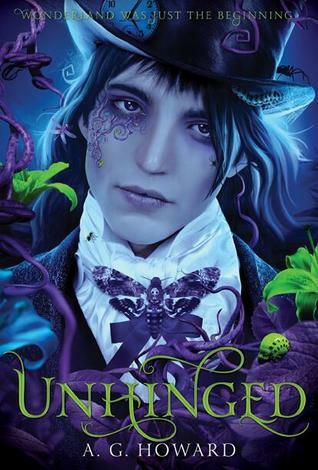 In Splintered, Alyssa went through a rather large character development, but it's nothing compared to what she goes through in Unhinged and Ensnared. And while some novels focus their development on the main character a lone, upon finishing Ensnared, there is an obvious development within Morpheus and Jeb as well. These three have been through so much that I wouldn't imagine them coming out of it unchanged. And if they hadn't, I would call foul and it would definitely take away from the beauty of the series. The love triangle aspect of the series is still present and perhaps a bit more prominent in these two novels. I know many people are anti-love triangle, and on occasion I am too, but the tension between Alyssa and Morpheus makes them one of my favorite YA couples. I could not get enough of their interaction and found myself rereading some of the scenes between them because I couldn't get it enough. Jeb on the other hand had to grow on me. I was very anti-Jeb after I finished Splintered and after Unhinged, but around the middle of Ensnared, I found myself appreciating him and his feeling for Alyssa. The ending to this series is perfect. I read the epilogue twice upon finishing Ensnared and chances are I'm going to be reading it again once I finish this review. 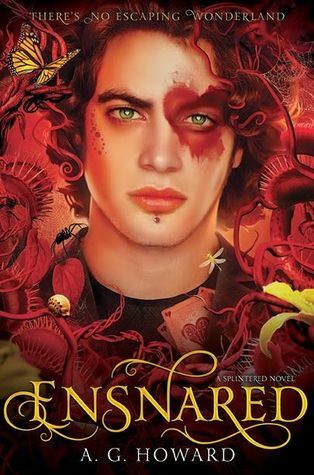 Even a few days after finishing Ensnared my mind would randomly drift to it's perfection, beauty, and magic. If you're looking for the best bitcoin exchange company, then you should pick YoBit.